16 Gallon Copper 4 Inch Diameter Mile Hi Flute – 4 Sections. This still has the versatility. 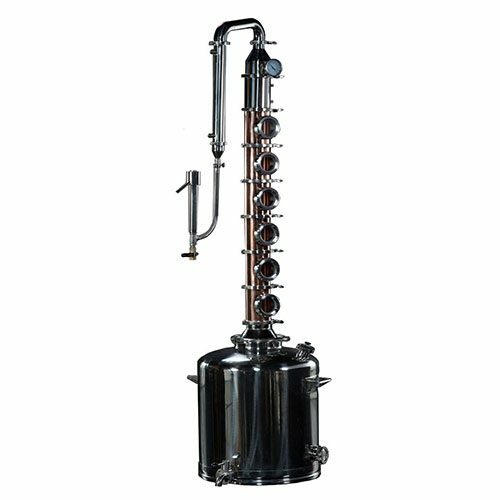 The modular design will allow you to remove the copper downcomer plates and the reflux condenser ( dephleg ) to run the still like a pot still or stripping still. 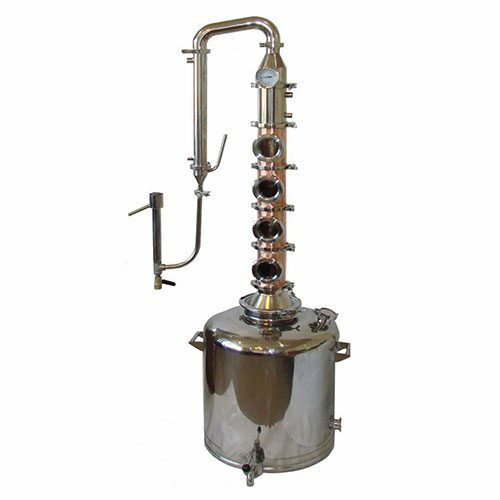 Add copper downcomer plates and reflux condenser to run as a reflux still for vodka and high percentage neutral spirits like moonshine. Add more sections with copper downcomer plates to get higher percentage up to 95% or 190 proof. 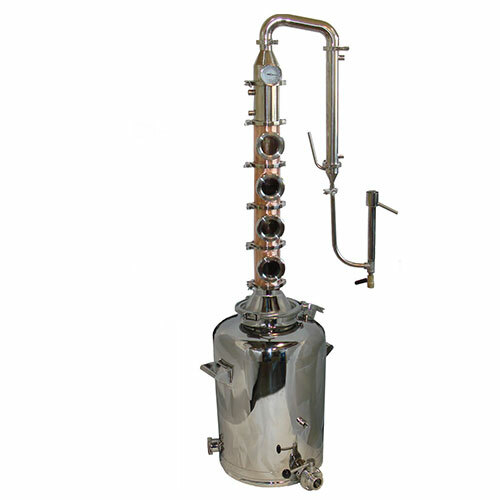 You can add a 360 degree 4 inch sight glass with a screened gasket as a gin basket or an infusion chamber. This can easily clamp in on the tower usually at the top of the tower. Infuse the vapor with flavor for a gin, or spiced whiskey or more flavor in a brandy. You can even make infused vodkas. 16 Gallon Milk Can Boiler has a 8″ rolled top for easy access for cleaning, 2″ fill port on top, 1/2″ coupling on the side for a thermometer, two of the 2″ ports for heating elements and a drain. 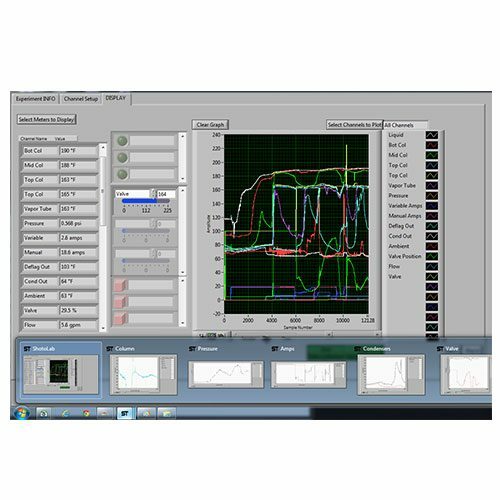 One 220V 5500 watt heating element will be sufficient but if you want to improve the initial heat up time then you have the option to add another heating element. There are two of the 2″ ports for heating elements on the Mile Hi Distilling 16 gallon boilers. All of the sections are made of copper and each section comes apart with clamps. As a result, this flute is very easy to clean. 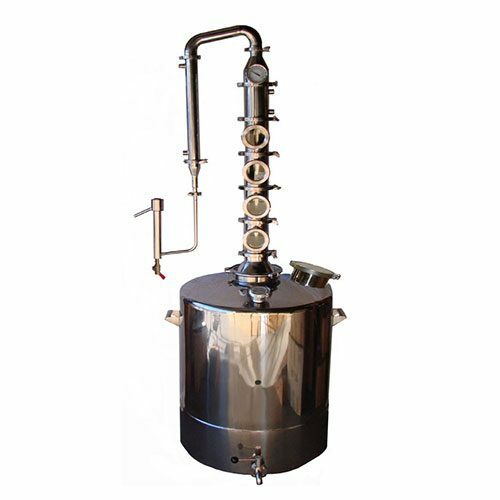 The Mile Hi Flute stills include four of the copper windowed sections, dephlegmator, shotgun condenser and parrot. You wont go wrong with this still. Quality is to the highest standard. The copper and stainless together is neat looking. It is worth the money. I love it!! “I have owned a 4” / 4 plate copper / stainless Mile Hi Flute for 4 years, recently upgraded to the 53 gallon boiler. I can not overstate the superb quality, finish, function of every piece of this system. I have also purchased several 5 and 10 gallon oak kegs, and a stainless / glass gin basket from them. All of them amazing, truly beautiful quality. All purchases were shipped promptly, and carefully packaged. The best customer service as well. Always unbeatable prices. Kudos to the folks at Mile Hi for doing business the old fashioned way, the right way.